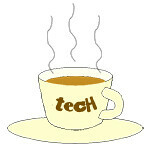 IBM « Tech bytes for tea? The new SPARC T5 and M5 servers redefine the economics of Enterprise Computing by delivering extreme performance and value for database and enterprise applications. 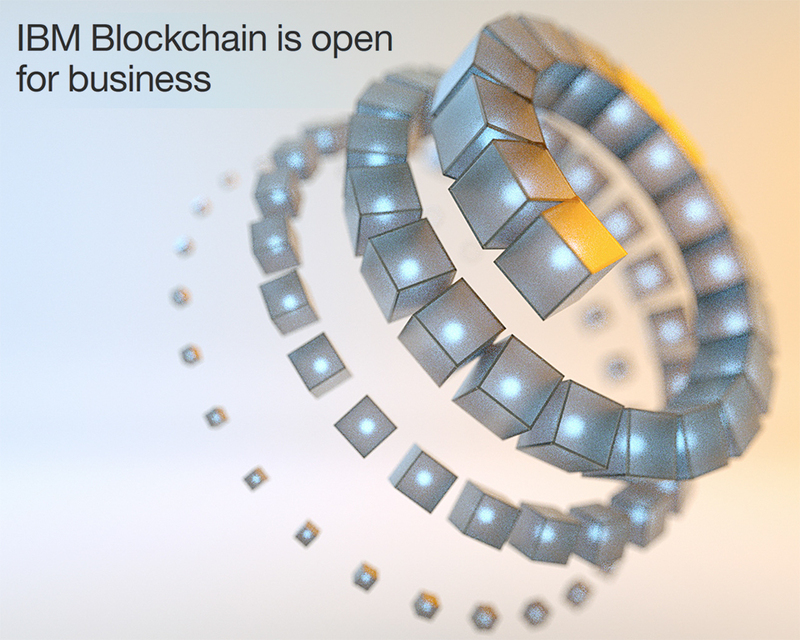 They trump the competition on multiple business-critical workloads. Oracle SPARC T5-8 server and SPARC M5-32 server. Not shown to scale. Oracle today announced a complete refresh of their midrange and high-end SPARC server lines with new SPARC T5 and M5 servers running Oracle Solaris. “Oracle has refreshed its SPARC family with the world’s fastest processor and launched the world’s fastest single server for Database, Java and multi-tier applications,” said John Fowler, executive vice president, Systems, Oracle. Oracle’s new SPARC T5 midrange servers are based on the SPARC T5, the world’s fastest microprocessor. Businesses today need the computing power to exploit Big Data to maximum advantage, in order to use analytics to discover growth and opportunities, and turn social streams into market intelligence. 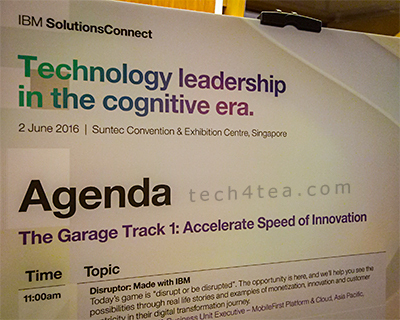 Traditional systems simply don’t have the horsepower to handle those demanding tasks. Oracle’s new SPARC T5 servers have set 17 world records(1) – awarded by independent industry organisations. The new Test Server from Micro Focus offers a revolutionary approach and additional test capacity to IBM Mainframe Application Testing. “We needed to find an innovative solution that would facilitate higher quality, scalable testing,” explained José Caetano Pereira, Senior IT Manager at BES. “By detecting errors earlier in the software development lifecycle, we will be able to deliver changes faster and deliver more robust software through to the User Acceptance Test phase and subsequent production.”Micro Focus, a leading provider of enterprise application modernization, testing and management solutions, has released Micro Focus Test Server – a unique technology that promises to accelerate testing processes while significantly reducing operating costs. Customers such as the largest listed Portuguese bank, Banco Espirito Santo (BES), are implementing Micro Focus Test Server to enable them to improve software quality by increasing available mainframe test capacity on a Windows platform. Micro Focus Test Server is an IBM z/OS compatible environment where application execution behaves just as it would on the target production mainframe. This makes it possible to perform a broad range of preproduction testing on readily available hardware. Testing capacity can now be easily increased to meet business-critical timeframes without incurring prohibitive costs. Micro Focus Test Server is the first and only IBM mainframe-compatible solution for system, user acceptance and integration testing. Support for a wide range of mainframe COBOL and Assembler applications and data including batch with JCL, online CICS or IMS TM, DB2, IMS DB and VSAM files. A black box test execution environment for composite applications where .NET and Java programmes invoke mainframe COBOL resources. Close integration back to the mainframe with seamless and secure access to mainframe source code libraries, applications and data, enabling organizations to integrate testing with resources that continue to reside on the mainframe. A proven test server engine that provides a high performance, robust execution environment for multi-region, multi-user testing. Yahoo! did well with profits beating estimates – could it be because expectations were low? Conversely, Apple didn’t do so good, missing analysts’ predictions for the first time in at least six years – but that’s probably because expectations were so high! Google’s doing real well with sales and profit beating estimates – from search advertising growth as usual. Microsoft is patting itself on its back – for not having bought Yahoo! back in 2008. And taking a swipe at Google’s Android – Steve Balmer says you need to be a computer scientist to use an Android smart phone, unlike Windows Phone 7. RIM’s still trying to find its way forward by taking a step backward – trying to bridge new QNX with “old” BlackBerry OS 7 – hope that works out. Amazon is being sued for screwing up the career of an actress by revealing her real age against her will in IMDb. On the corporate IT front, industry bell weather IBM missed analysts’ estimates on slowing revenue growth at its software, hardware and services businesses. For the first time in 15 years, since 1996, IBM has overtaken Microsoft in market value. It is now the second largest US tech company behind Apple, while Microsoft has dropped to third. 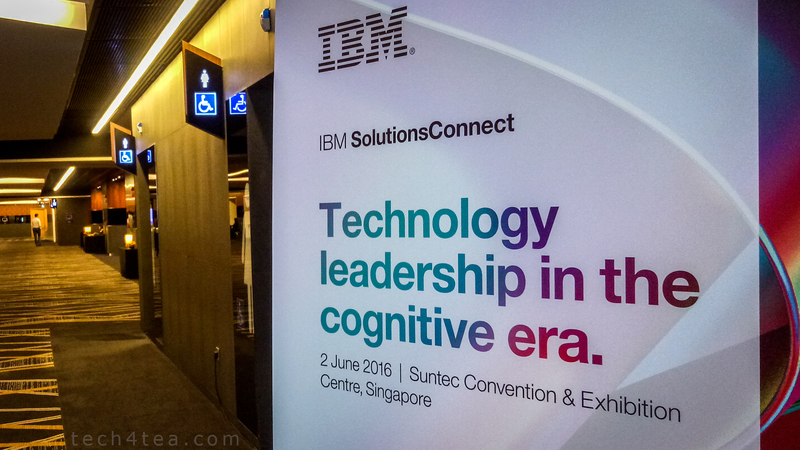 Only a year after Apple had surged past Microsoft in market value, IBM has also powered past Microsoft. IBM had been the dominant company in the computer industry for decades until it selected Microsoft to supply the operating system for its personal computers in the eary 80s. Bill Gates managed to turn that opportunity into a dominance of the operating systems market. 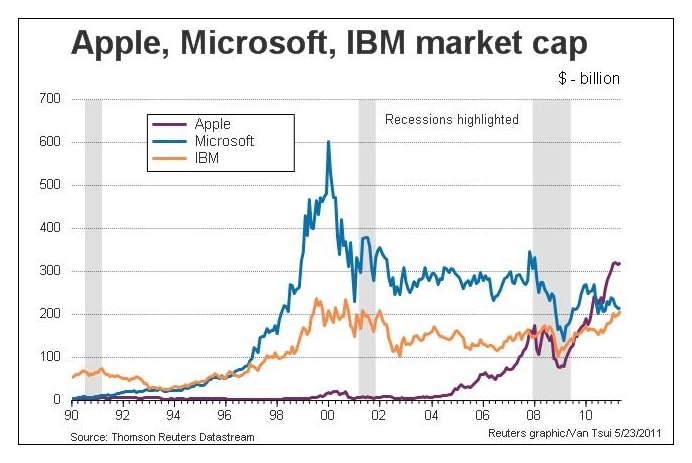 At its zenith just before the turn of the millennium, Microsoft’s market capitalisation was three times that of IBM’s. It was also the biggest US company then. Now it is the third biggest technology company and fifth biggest US company. Microsoft is facing challenges in many of its business sectors. Its dominance of the operating systems market, is being challenged by the advent of tablets and Google’s newly introduced Chrome OS, while it has lost its market share in the smartphone market to RIM’s BlackBerry devices, Apple’s iPhones and recently Android based phones. Microsoft’s decline since 2000 coincides with the burst of the Internet technology bubble and the tenure of Bill Gates’ successor Steve Ballmer as the CEO. IBM, on the other hand, has reinvented itself from being a predominantly hardware manufacturer into a specialist in enterprise software, servers and consulting. It has even offloaded its PC business to Lenovo in 2002.